Water is the dominant force that sculpts the volcanic landscape of the West Cascades. 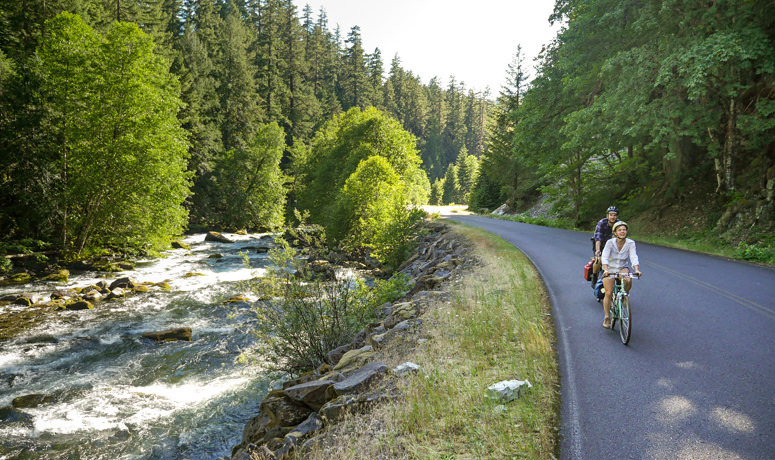 The Cascading Rivers Scenic Bikeway celebrates the rivers we treasure in the Northwest, by following two of the most rugged and beautiful: the Clackamas and the Breitenbush. All along this route, water and rock interact to create dramatic beauty and inspiration. Imagine: 70-plus miles, from Estacada to Detroit, riding on remote roadways – all of it following the course of rivers. At times you’ll be close enough to the water’s edge to be tempted to pull over and take a dip (there are also some hot springs along or near the route). Other times you can listen to the water as a soothing background soundtrack, or tune into the wind softly whooshing through the trees of the dense and ancient forest, or enjoy a symphony of forest songbirds. You may also experience glimpses of majestic elk or a fluttering grouse along the way. 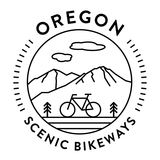 The bikeway parallels the nationally designated Wild and Scenic Clackamas River along rocky riffles, quiet pools and reservoirs. Beneath the waters, native runs of coho, chinook and steelhead salmon seek their ancient spawning beds. Mt. Hood and Mt. Jefferson loom on the horizon. If your trio of riding perfection consists of road, water and trees, this route will fulfill your soul. 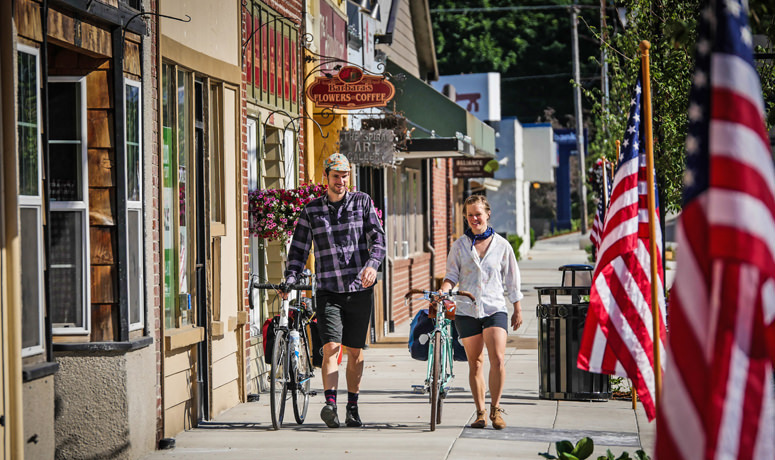 At either end of the route, remove the stresses of civilization with a walk through the towns of Estacada or Detroit. Both are full-service towns with many options for eating. Both towns are situated on tranquil waters and are similarly rooted in historical attachments to water power, mountains and forests. Route Note: This route can be ridden in either direction. The elevation gain is different depending on your direction; you’ll climb 3,125 feet starting from Estacada and 1,985 feet starting from Detroit. A shorter family-friendly ride is also available from Estacada; check with the Chamber of Commerce at the route start. Travel Notes: If you’re coming from the north or through Portland Airport, you can use the Portland TriMet system all the way to Estacada. Free parking is available in both Estacada and Detroit. The U.S. Forest Service offices in both Detroit and Estacada offer campsite information and road condition reports. This route is closed during late fall and winter. Traffic Notes: Motorized vehicle traffic volume is low to moderate in late spring and fall, but higher on weekends and holidays during summer months. Most of the route through the national forest is narrow, steep and winding with limited to no shoulder. Watch out for truck traffic, fallen rocks or trees, and possible damaged road surface conditions and slippery surfaces during wet or icy weather. In the winter, Road 46 is not maintained for travel. Much of the route is closed by snow in late fall to early spring. Roads are only maintained from late spring to fall. Check Road 46 status with local Ranger District offices. Highway 224 conditions can be found on ODOT’s Trip Check website. Cell coverage is extremely limited. Check out Oregon’s Mt. Hood Territory and the Estacada Chamber of Commerce to find more sights to see and things to do near this Scenic Bikeway. Camping and hot showers are available at Milo McIver State Park and Detroit Lake State Park. 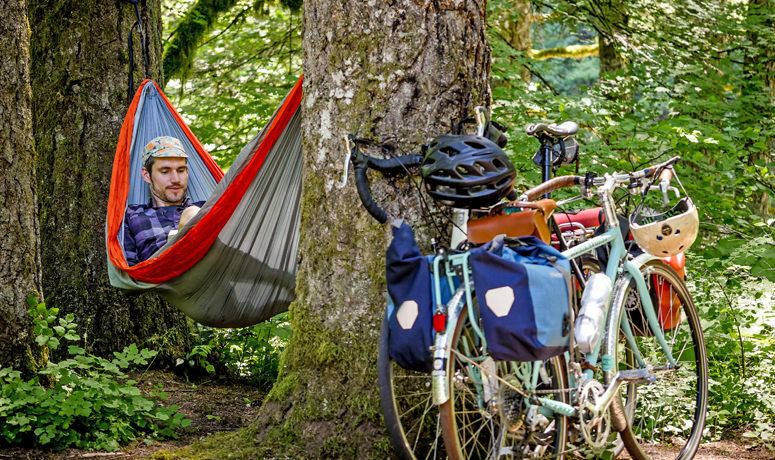 Milo McIver State Park offers hiker-biker sites for a reduced rate.